You will recieve all four designs shown in the first photo (Reindeer, Santa, Snowman & Gingerbread) to stitch on cotton fabric for coloring with fabric markers, or on felt as a redwork design. A photo tutorial is included to show how to create the gift card/tag pocket on the back, and how to line it up properly with the front of the design. 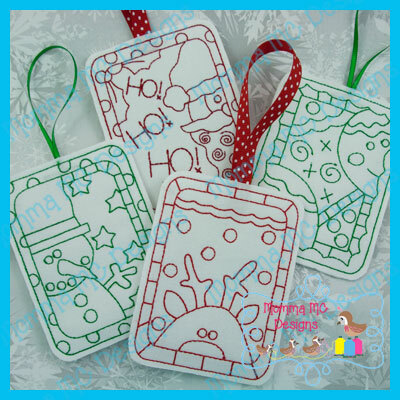 Also included is a set of printable gift tags - Merry Christmas, Happy Holidays and Happy Hanukkah.